Our founders, Miriam and Kenneth Johnson, established EcoColors twenty-one years ago in Cancun, Quintana Roo, Mexico. 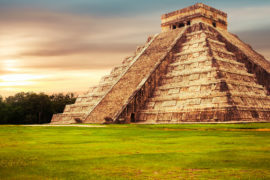 Since January 1997 we have carried out successful eco-tours for many demanding individual travelers, special interest groups and institutions all of whom wanted to learn about and ultimately left amazed from their experiences in the unique Mayan World. Some of our notable clients have been: The American Museum of Natural History, the Audubon Society, World Wildlife Fund, Washington State University, The School of Environmental Studies of Minnesota, the BBC and many more. Private Mexico Tours who directly follows the footsteps of EcoColors is enriched with these experiences. We want to learn about your needs and wishes so we can create a personalized itinerary that will help you to make your dream trip come true. We can build a tour around any of your desires or passions. Everything is possible, such as swimming with whale sharks, manta rays or sea turtles, bird watching, biking through the Riviera Maya, visiting archaeological sites or discovering the beautiful nature of the Yucatan Peninsula. Every tour is customized and will be executed with only you and your travel party. The different tours of EcoColors are operated by professional guides who are biologists or naturalists that participate in research and protection projects in the Mayan World. In this way we want to give our clients the unique opportunity for a very solid interpretation of the Mexican flora and fauna. Private Mexico Tours are happy-go-lucky. You do not have to take care of anything. While you are having the greatest time we will take care of you. Our guides, along with the rest of the company are not only there to secure your happiness, but also to guarantee your safety. You can fully enjoy your holiday knowing that if you run into any matters, we will be there for support. We are really aware of the importance of the environment and wildlife in the region and want to help preserve them. This is why we operate with small groups to minimize the impacts of the tours on the nature. We work with other companies and organizations that are working with eco-tourism and adventure. We raise awareness of the importance of the ecosystems in Mexico by teaching travelers about the nature and history of our country and region. In order to provide the best information to travelers, all our guides are educated in the scientific and biological field. Finally we also make donations to projects that protect the Mayan nature.